In a candid interview, Doug Beattie said it was time for the secretary of state to “stop stalling” and cut MLAs’ pay. It comes after Karen Bradley she was “minded” to cut salaries by 27.5% – but would first consult the parties before making a final decision. Mr Beattie said there was “no need” for any further consultation on this issue, adding that all the main parties had “already made their views perfectly clear”. “I was disappointed by the secretary of state’s latest announcement. 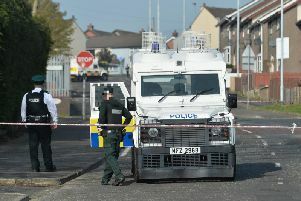 There is consensus across the board that things cannot stay as they are,” the Upper Bann MLA added. The former soldier added that he had been “deeply depressed” by DUP MLA Simon Hamilton’s assertion that devolution was unlikely to be restored this year and even beyond that. He added that, with the prospects of power-sharing returning in the short-term looking bleak, many MLAs – himself included– could be forced to consider leaving political life. Mr Beattie said: “I don’t think any MLA got into politics for the money; I know I didn’t. In fact I left a better paid job to become a politician. He added that he was “slightly ashamed and embarrassed” that he is currently unable to fully carry out his role as an elected official. “I am an elected MLA and I have to go cap in hand to permanent secretaries just to find out what is going on,” he said. “The whole situation is ridiculous and it cannot continue indefinitely. Meanwhile, SDLP MLA Daniel McCrossan said he fears that local devolved government will “be lost for a generation” as a result of the ongoing political impasse at Stormont. Previously, the West Tyrone representative told the News Letter that, while he was not seeking to leave politics, he is considering returning to a law career on a part-time basis to supplement his income. He added: “The latest update from the secretary of state only serves to show how fragile the North has become and how the DUP and Sinn Fein have created a de facto political vacuum.